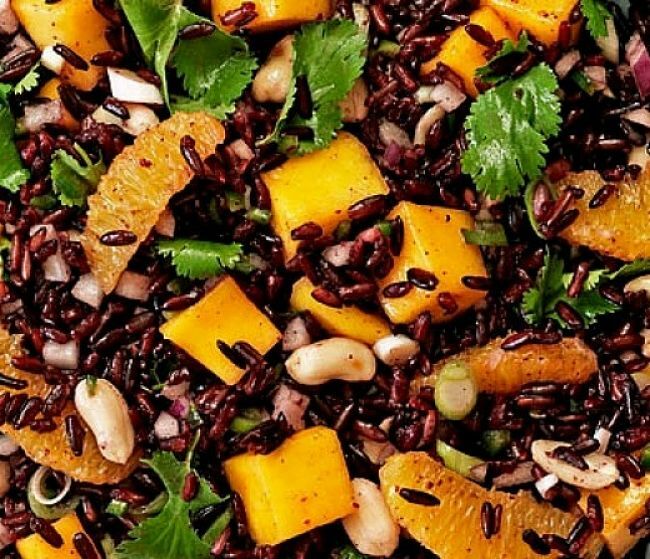 Black rice, which is also known as forbidden rice or purple rice, as it turns purple when cooked, is increasingly being recognised as a whole food with wonderful health benefits for nutrition. Black rice is an ancient type of rice that has been much revered in China but has been virtually unknown in the West, until recently. It was called "Forbidden Rice" as supposedly only the upper class nobles could eat it. Black rice is generally cooked and eaten with the husk on, retaining the bran which contains most of the nutrients. Black rice has traditionally been used mostly for food decoration, salads, noodles, sushi, various specialty dishes and desserts. However it has been used for a variety of dishes in the West because of its status as a so-called 'superfood'. This cereal is very low in sugar but is packed with healthy fiber since the rice is eaten whole. Just a single dessert spoon of black rice bran contains far more health promoting Anthocyanin antioxidants than are found in similar quantities blueberries and black rice has more fiber and vitamin E antioxidants as well. 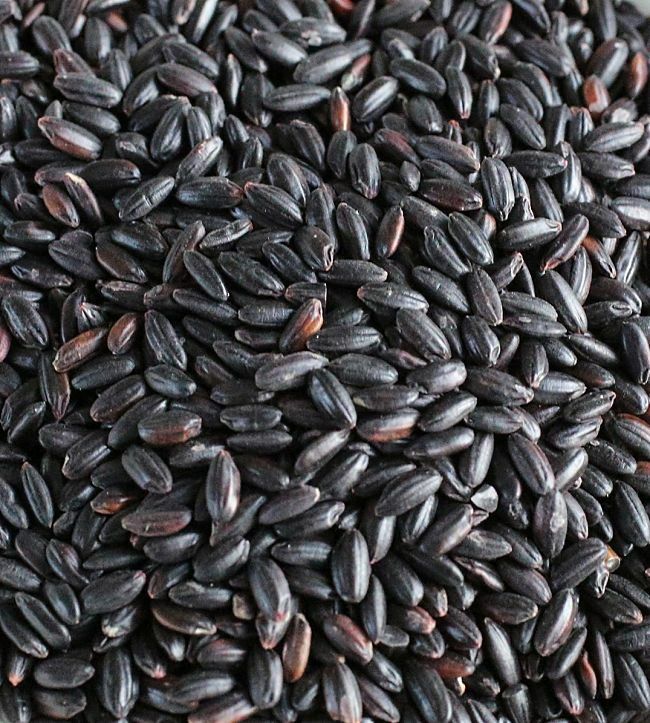 The Anthocyanins produce the dark colors of many vegetables and fruits and vegetables, such as blueberries and this is what makes black rice "black". Brown rice is much more nutritious that white rice because it has higher levels of fiber and healthy vitamin E compounds and antioxidants. However brown rice is seldom eaten in the West for unknown reasons. When brown rice is processed, the bran or husk that is on the outer layer of the rice grains to produce the refined white rice. 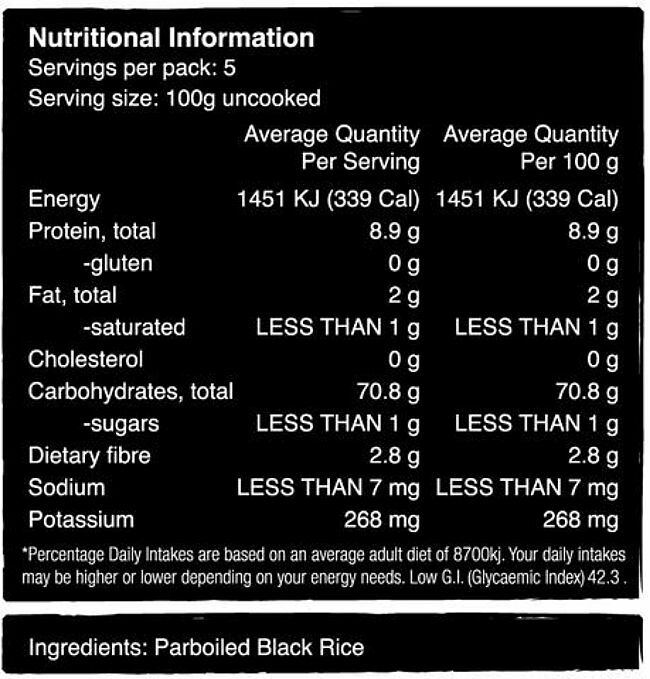 Black and other natural varieties of rice that are purple or black in colour are even healthier than brown rice.As shown in the table below, black rice has a similar amounts of fiber, protein, fats and calories to brown rice and has a mild, wild and nutty taste that is very appealing for a range of dishes. 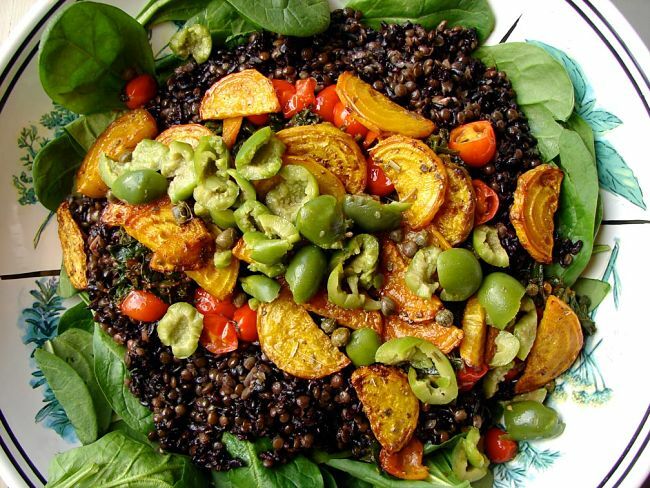 Many people who won't eat brown rice will eat black rice dishes.It is the trace elements and nutrients in black rice that are especially important. 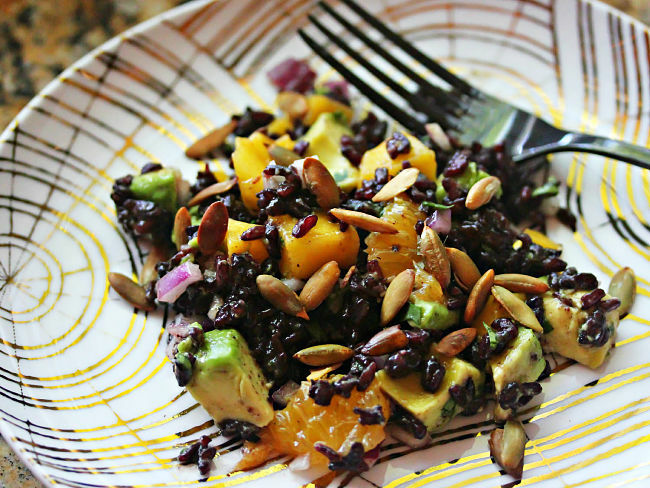 Black rice contains 18 amino acids and moderate levels of iron, copper, zinc, carotene, and important vitamins. In traditional Chinese Medicine, black rice is claimed to be beneficial for the stomach, kidney and liver. There are a number of varieties throughout Asian including a Thai jasmine black rice is grown in Thailand. Chinese Black Rice (also referred to as Forbidden Black Rice) is a medium grained glutinous or sticky rice. It is different from the purple sticky rice varieties, as it is not as sweet. 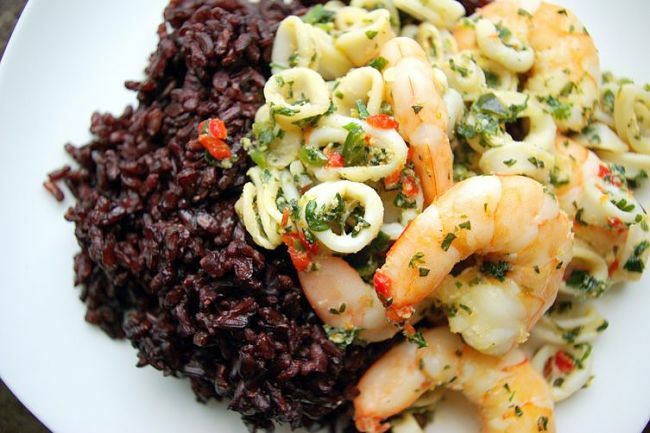 The types of black or purple rice in your area will differ but the recipes will suit most of the common varieties. 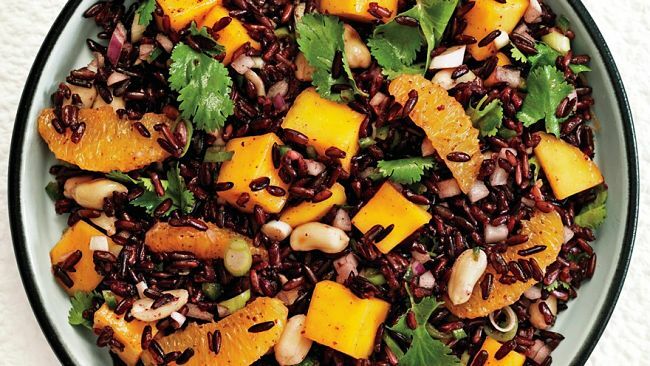 Black rice can be used for both savory and sweet dishes and the uses has expanded considerably in the West where black rice is combined with many non-Asian traditional ingredients an has been used for salads. When soaked and cooked the true color of this rice is revealed. It is generally not black but a rich burgundy to purple color, and the color will spread through the dish and dye foods that are combined with it, for example coconut milk in a dessert. Beware it can stain cloth and even ceramic dishes. Black rice is sometimes used to make entrees, and side dishes for other main meals, but the most frequent traditional use is for Chinese desserts. Its use has expanded greatly in Western dishes where it has replaced brown rice. Many people also use mixtures of rices (black and brown), but cooking can be problematic difficult when black rice is combined with white rice. 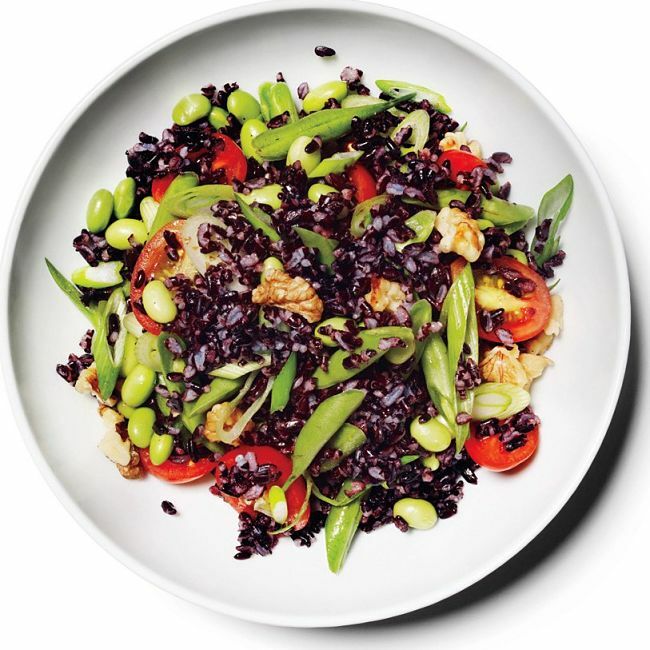 Black rice is unhusked, like brown rice, and needs to be cooked for a longer time than white rice. If you have the time, it is a good idea to soak the rice for about an hour prior to boiling. Take one cup of dry black rice, rinse well, and add 1 3/4 cups of water stir and let soak for an hour. No draining or adding extra water is required as rice is cooked in the soaking liquid. Add about 1/2 teaspoon of salt (depending on taste), bring to boil, cover and gently simmer for about 30-35 minutes. Check to see that the rice is just cooked, take the pan off the heat and let stand for an additional 10 minutes with the pot covered. You can add a little oil or butter, depending on taste and use for the rice, then fluff to separate the grains and enjoy. Take 2 cups Chinese black rice and rinse thoroughly using a sieve under running water, or using several changes of water in a pan. Drain and then add the rice to a heavy saucepan with 3 1/2 cups water, 1/2 teaspoon salt, and 1/4 teaspoon pepper. Bring to the boil over medium-high heat with saucepan, uncovered. Then cover the saucepan, reduce the heat to very low, and cook slowly until rice is tender and almost all of the water has been absorbed. This will generally take about 35-45 minutes. Remove from heat and let the pan stand, with the lid on for an additional 10 minutes. Use a fork to fluff the grains and serve or add to the dish you are preparing. 1 cups of black rice1 can (2 cups) unsweetened coconut milk (shake well before opening)1/2 cup of sugar (or a substitute)Add the rice, 3 cups of water and 1/4 teaspoon to a heavy saucepan and bring to the boil. Reduce the heat to low, cover the saucepan and simmer gently for 40-45 minutes to cook the rice. Add the sugar, another pinch of salt, and the coconut milk. Turn the heat to high while stirring to bring the mixture back to a boil, and then reduce to low and gently simmer uncovered, stirring several times, until mixture is thick and the rice has become tender, about 20-30 minutes. Remove from heat and set aside to cool for about 20 minutes, stirring occasionally. Stir the mixture again just before serving, and drizzle the remaining 1/2 cup of coconut milk over each serving. Add the water, rice and salt (to taste) to a small saucepan and bring to a boil over high heat, stirring occasionally. Lower the heat and simmer gently, covered for 40 to 50 minutes. All the water in the pan should have been absorbed by the rice. Then take the pan off the heat and set aside partially uncovered for about 10 to 15 minutes to cool. Cook the edamame, drain and transfer to a medium bowl together with the rice, walnuts, lentils and cilantro. Meanwhile combine the lime juice, ginger, rice vinegar, soy sauce, cayenne, grapeseed oil, walnut or sesame oil in a small bowl. Toss the liquid through the rice salad ingredients. Rinse the rice well and drain. Add the rice, water, and 1/2 teaspoon salt to a medium saucepan. Bring to the boil over high heat and then reduce the heat, cover the pan and simmer to cook the rice for about 30 minutes. Most of the water should be absorbed by the rice which should be just starting to get tender. Remove from the heat and let the pan stand, covered, for about 10 minutes to cool and complete the cooking.While rice is cooling, fry the ginger, scallions and sweet potato in a frying pan over high heat, stirring occasionally, for about 2 minutes. Reduce the heat to moderate add the remaining salt and pepper to taste. Complete the cooking with the pan covered, for about 12 minutes. Then add the rice and combine gently before serving as side dish. Heat the chicken broth over medium-high heat in a saucepan just to simmering point, add the lid and keep warm. Heat the oil in a frying pan over moderate heat and fry the onions until soft (about 4-6 minutes). Add the rice, coat all the grains with oil and cook stirring continuously for about one minute. Lower the heat to medium, add the wine in small portions until the liquid is absorbed ( generally about 3 minutes).Using a ladle, slowly add 3/4 cup hot broth, stirring constantly and cooking until all the liquid is absorbed (generally about 6 to 7 minutes). Repeat this process adding 3/4 a cup at a time for the remaining broth. After about 50 minutes the rice will be just cooked ( a little soft but chewy. Sprinkle on about one teaspoon salt, and some pepper to taste and 1/2 cup of the parmesan, and combine. Serve into bowls and top with some parmesan cheese and the basil.